Discussions of Muzafer Sherif’s camp studies revolve around the behaviour of human groups. Typically, the warring between two groups of children is presented as something atavistic, an inevitable outcome of competition for resources. But Sherif and his team took an active role in the facilitation and fanning of conflict between the children. What did children make of the camp and how ‘natural’ did it seem to them? For both of them the three-week camp involved a number of firsts. It was the first time either of them had been to a summer camp, it was the first time they met and it the first time they saw a man shoot a gun. Bill and Ovis were members of the Rattlers group at Robbers Cave in 1954 and while they don’t recall a lot about the camp, they each recall the same incident in vivid detail. They remember paddling a canoe across a lake. As the canoe moved close to the bank they heard a commotion in the bushes at the lake’s edge. As they got closer they saw two snakes had hold of a large frog. Each snake had one of the frog’s legs in its mouth and the frog was thrashing about, trying to free itself. Bill and Ovis were both city boys and paddling a canoe on a lake in the wilds of southern Oklahoma was a novel experience. So was seeing a snake, let alone two snakes in the act of swallowing a frog. As the boys watched in fascinated horror, the man with them in the boat drew a gun and shot and killed both snakes. Bill, Ovis and the rest of the boys in the canoe would later call their group the Rattlers in honour of the incident on the lake. The adults would discover that this was easier said than done. In all three of the intergroup conflict studies that Sherif conducted between 1949 and 1954, the boys showed their curiosity about the men running the camp and looked to the adults for guidance. In the first study in 1949, Sherif, who disguised himself as ‘Mr Musee’ the camp caretaker, wrote that ‘once when I was taking notes the boys asked if it was part of the study’. Also during a baseball game a boy asked Sherif why he only took pictures of the disputes. In the second study in 1953, which Sherif later wrote off as a failure, one boy asked the staff what the microphones hanging from the rafters in the mess hall were for. In the same study, boys who formed friendships during the initial whole-group phase felt aggrieved when they were separated from new friends. Resentment towards camp staff intensified during the competition phase as both teams accused staff of bias and favouritism. In their attempts to increase tension between the groups, the experimenters were intent on keeping the two teams neck and neck in games or activities in which points were awarded. A rumour amongst the boys that the camp was an experiment in which they were expected to fight one another was confirmed when one boy found a staff notebook including detailed observations of the groups’ reactions. As Michael Billig (1976) pointed out, Sherif’s intergroup conflict experiments involved three groups, not two. In addition to the two groups of boys, in each of the camp studies there was the experimental team that included Sherif and his group of participant observers who played the role of ‘senior counsellors’. Junior counsellors were also allocated to each group of boys. These young men were undergraduates who took on the role of typical camp counsellors, and were required to stay with their group at all times to ensure their safety and coordinate and support the activities planned by the experimental staff. The junior counsellors had no role in the experimental team. Their job was to deliver the activities planned for the two groups and ensure that their group was engaged as instructed. They slept in the cabins with the boys, took them to the mess hall for mealtimes, supervised their swimming, and accompanied them on hikes and other outdoor activities. In contrast, the participant observers, while involved in organising and running activities with the junior counsellors had the additional role of observing the boys closely: taking notes, shooting film footage and taking photographs. As Sherif already knew, instructing staff to keep a ‘professional distance’ from the boys was a constant balancing act. In the day-to-day conduct of the experiment, the boundaries between participant and observer, facilitator and participant were at constant risk of being blurred. Staff supplied the matches for flag burning, took photographs during raids of the other group’s tent, and were present when boys discussed and made plans for retaliatory raids. If the canteen staff found Sherif’s permissiveness shocking, the boys too were surprised by the lack of intervention by the adults. Typical summer camps of the time such as those offered by boy scouts or church groups – some of which the boys or their siblings had attended – featured interventionist adults whose goal was to foster independence, cooperation and camaraderie amongst the boys in their charge. In contrast, in the experimental camp the same values were ignored if not actively discouraged. For example, in the 1953 study, when a winning team congratulated their opponents for their good sportsmanship after a game, their senior counsellor called them ‘soft’. So what did the boys make of this ‘hands-off’ approach and the reversal of expectations about their behaviour and that of their opposing team? None of the handful of boys I’ve spoken to remember the camp they took part in as a happy event. The observation notes compiled by Sherif’s team note symptoms of anxiety among some of the boys, including bedwetting, running away and homesickness. For Sherif and his team it was important that staff did not interact with the boys in any way that might influence the group dynamics they were hoping to study. But the practicalities of running a study of such size and scope made this impartiality almost impossible. There’s no question Sherif and his team felt under considerable pressure. The intergroup conflict experiments required the two groups to move through four distinct phases. And each stage was completely dependent on the one before it. Stage 4, the final stage of resolution could only occur if conflict had broken out in Stage 3. And conflict could only break out if each group had formed a strong identity during the earlier stage. This experimental framework structured the experiment. Sherif allocated specific blocks of time to allow for each group to form and bond, but he wasn’t able to predict exactly how long the friction between the two groups would take to develop, nor how long it would take to heal the rift between them. With limited time and resources the pressure was on the experimental team to move the groups from one phase to another in the 21 days available to them. Some interventions by staff were relatively routine manipulations of the experimental environment to achieve a desired result. For example, artificially inflating the scores of one team over another to increase rivalry was common in both the 1953 and 1954 studies. But other ‘planned frustrations’ were more contentious, with some staff at the 1953 camp objecting to the degree of intervention that took place as the days allocated to reach the conflict stage dwindled. One staff member recalled his dismay when other staff pulled one of the tents down in the hope that one group of boys would blame the other and the experiment would move to the next phase. ‘It was supposed to be like watching a rat in the maze. But you don’t push the rat’ (Personal communication, 14 July 2012). Robbers Cave was Sherif’s third and final try in the intergroup conflict series and his research funds were almost exhausted. The pressure was particularly intense after the failure of the 1953 study. For an experiment the size and scope of Sherif’s there was an enormous amount of pre-planning that had to take place. In the aftermath of the failed second attempt, Sherif handed the organisation of the next study to his right-hand man and graduate student OJ Harvey, who it was said ‘could organise a bucket of worms’. Sherif and Harvey made plans to overcome the problems that had plagued the previous study. This time Harvey deliberately chose boys with sporting ability, observing them in school playgrounds across Oklahoma City. Highly athletic boys, they reasoned, were more likely to be competitive, more likely to identify with their team and derogate their opponents, therefore making open conflict between the two groups more likely. But the fanning of the conflict between the Rattlers and Eagles turned what the boys thought was going to be a fun summer camp into something quite different. OJ Harvey recalled that as the friction intensified so too did the risk that the boys would want to go home. The success of the experiment depended on the boys staying until the end. Moving quickly to the resolution phase where both groups were brought together in a series of cooperative tasks was a relief for the staff who were finally able to reach a stage of the experiment they had not reached before. But it was also a relief to the boys. The conflict was over, the groups worked together, and finally they headed home. 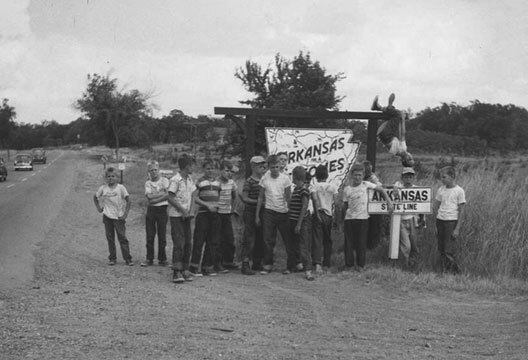 In the café halfway between their two homes in Oklahoma, Bill and Ovis revisited their memories of Robbers Cave almost 60 years after the event. Bill remembers his first camp as a chance to be independent, to have a holiday his parents would not normally be able to afford. In contrast, Ovis remembers how good going home felt. I didn’t realise how homesick I was until I got home and saw my parents again... I remember tearing up a little bit when I saw my folks. For both boys the adults at the camp loomed large in their memories of the competitiveness, the raids, the fights and the final reconciliation. Sherif may have hoped his experimental team would be unobtrusive and have no influence on the young boys who came to camp. But in the boys’ eyes, the adults were central. After all, the Rattlers named their group in honour of the gun-slinging man who freed the frog from the rattlesnakes. In their eyes he was not only a hero, he was a member of their group. Identified through staff observations as an emerging leader of the Panther group, Doug was named catcher for his team – a role best occupied by the team leader – in a baseball game against the Pythons. Doug was mystified by the staff’s choice. Doug was carried off the field and the game went on without him. Two nights later on an overnight camping trip staff noted that Doug woke them four times in the night to complain of stomach pains. Finally, at 4am he was ‘marched’ through the woods back to main camp and the dispensary. The camp ended for Doug with his parents picking him up from hospital. Billig, M. (1976). Social psychology and intergroup relations. London: Academic Press.